You are here: Home / holidays. / St. Patrick’s Day neighbor gift. St. Patrick’s Day neighbor gift. 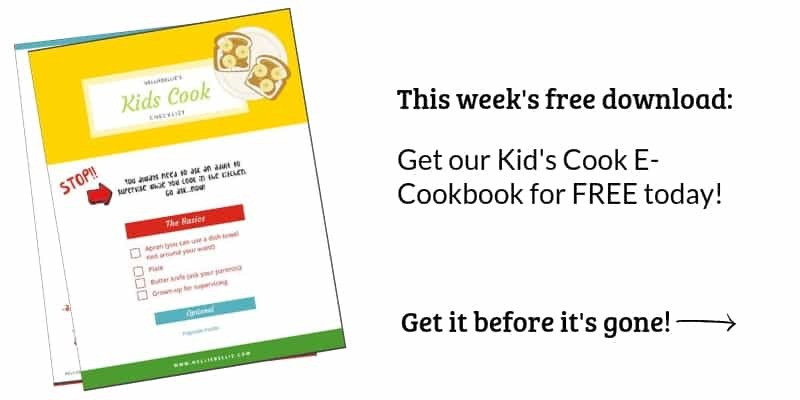 This easy craft is perfect for kid’s to make on a weekend afternoon. It combines stickers with nail polish for a surefire creativity hit! 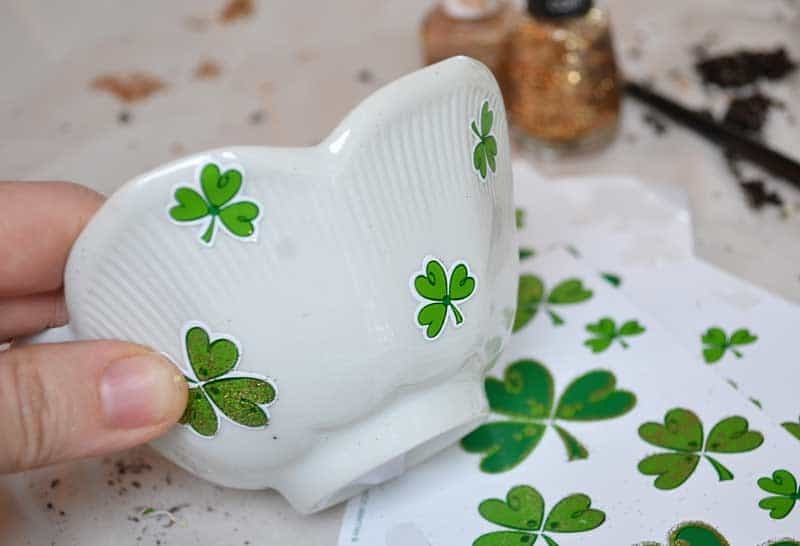 You’ll love that this craft is easy, fast, and clean-up is a breeze. 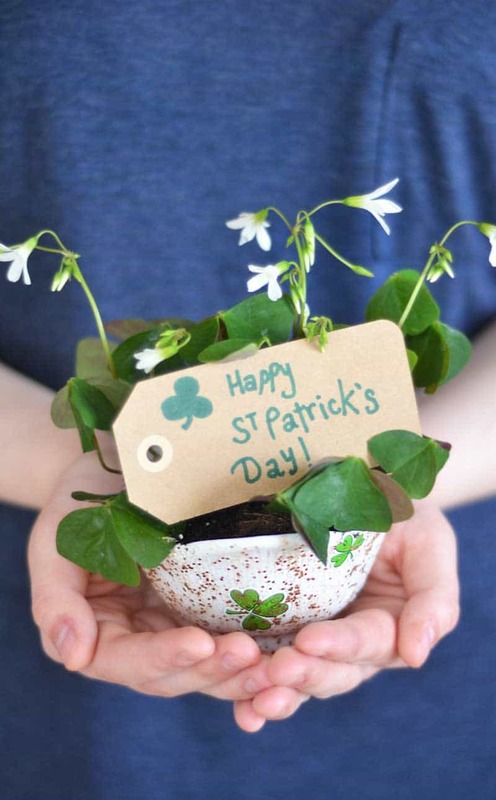 Plant shamrock (clover) plants in their planters and send them out to gift them to the neighbors. Cutest little gifts you’ve ever seen! Don’t feel tempted to pick up those cute little plants you see in the grocery store. This project is SO much more personal and adorable! Cover the white dish (stickers and all!) with sprinkle gold nail polish. Use the cheap stuff!! For one of the dishes (center in below photo) I used clear nail polish with gold glitter OVER a coat of gold nail polish. I suggest grabbing a few cheap gold polishes and give the kids options. Let them go to town and cover their dishes themselves. Remember to have some remover on hand to clean up messes. 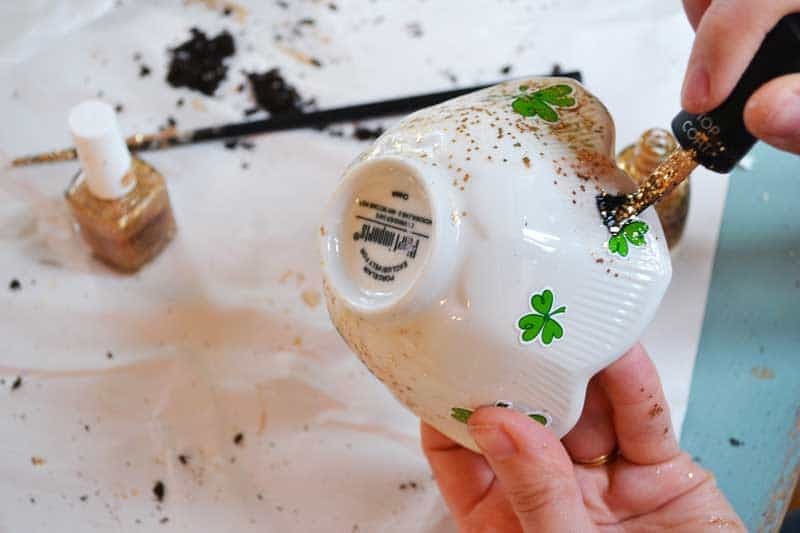 Put shamrock plants into their finished bowls for the perfect neighbor gift! If you like, add a simple little card or tag to the plant before carrying it to the neighbors. Note: The Shamrock is regarded as the national plant of Ireland and is the most well-known symbol of St. Patrick and St. Patrick’s Day. Legend says if you find a four-leaf clover on St. Patrick’s Day it brings good luck.